Published on January 26, 2010 in General T&T, PNM, Politics and UNC. 15 Comments Tags: Basdeo Panday, COP, Jack Warner, Kamla Persad-Bissessar, Patrick Manning, Politics, UNC. Sunday night’s victory by Kamla Persad-Bissessar, placing her as the new political leader of the opposition United National Congress (UNC), is tantamount to a political earthquake in T&T. And while the political shake-up may not leave anyone dead, there are likely to be many careers that end up being badly wounded. Mrs Persad-Bissessar has done what many men before her have failed to do: she toppled the man whose name has become synonymous with post-independence opposition politics in T&T—Basdeo Panday. Although the election machinery was clearly stacked against her and her slate with a large number of voters being disenfranchised, the huge margin of Mrs Persad-Bissessar’s victory for the post of political leader of the UNC was a clear indication that almost every member of the party wanted change. 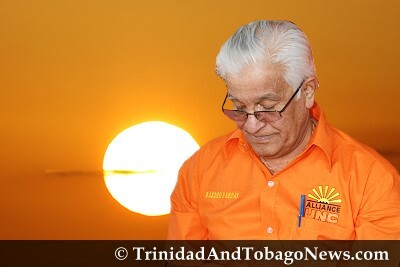 Defeated UNC leader Basdeo Panday has no intention of voluntarily giving up the position of Opposition Leader to allow new Political Leader Kamla Persad-Bissessar to assume that office. He suggested yesterday that it was up to the elected MPs to advise the President that he no longer has their support, if they wished. UNC chairman Jack Warner feels former leader Basdeo Panday would, on his own volition, do the honourable thing and resign as Opposition Leader. Naparima MP Nizam Baksh yesterday urged his parliamentary colleagues to give newly-elected political leader Kamla Persad-Bissessar the support she needs to become Opposition Leader. Defeated political leader of the United National Congress, Basdeo Panday, ducked and ran from media personnel outside the Port-of-Spain Magistrates’ Court yesterday after he reappeared before a magistrate charged with failing to declare his London bank account to the Integrity Commission. WHILE choosing not to comment directly on the UNC election results which saw Siparia MP Kamla Persad-Bissessar topple Basdeo Panday from the post of political leader, Prime Minister Patrick Manning yesterday expressed sympathy for Panday. Prime Minister Patrick Manning says the PNM will fight the Opposition, under new political leader Kamla Persad-Bissessar, ‘very seriously’ in any future election. It may be difficult for him to face this reality, but Basdeo Panday must accept that his day has passed. This doesn’t mean that he does not still have a valuable contribution to make to the politics of the country, but he must choose his future course carefully. New UNC Political Leader, Kamla Persad-Bissessar, said yesterday she was not ‘yearning or longing’ to become Opposition Leader. UNC POLITICAL leader in waiting Kamla Persad-Bissessar needs the support of seven colleagues in the Lower House to become, for yet another time, Leader of the Opposition. Siparia MP Kamla Persad-Bissessar won hands down at the UNC internal elections on Sunday, beating fellow contenders, Basdeo Panday and Ramesh Lawrence Maharaj, even on their home turf by a large margin. 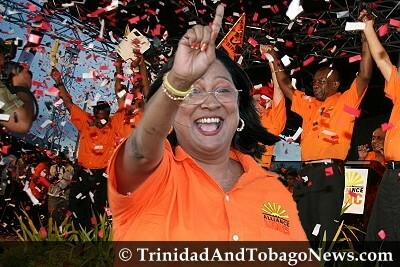 WE heartily congratulate Siparia MP Kamla Persad-Bissessar on winning the UNC leadership on Sunday, ahead of current UNC leader Basdeo Panday and Tabaquite MP Ramesh Maharaj. But while she yesterday garnered the unqualified support of four colleagues, including, for the first time, Naparima MP Nizam Baksh, the road to the crucial post remains filled with some obstacles. According to Section 83 of the Constitution, the President appoints an Opposition Leader based on his judgement of who commands the support of the majority of opposition members. With 15 UNC MPs in the Parliament, seven must support the person appointed Opposition Leader. It means Persad-Bissessar needs the support of at least three more colleagues, many of whom are Panday loyalists, to take the reins of the Opposition benches in the Lower House. It makes no sense at all. My previous theory has been completely destroyed. I had originally asked myself a number of questions. Why would panday brutally attack kamla after he discovered that it was only backfiring on his campaign? Why would panday continue after he was bashed for treating a woman in this way? Why did panday make a racial comment about jack? Why did he not attack kamla and warner on the issues(vision,track record,etc) only? Did panday contribute to the successful campaign of the woman and the black man by behaving in this way? Why was the daughter of panday not involved in the mud-slinging? My original theory was that panday did everything he could to lose the election. His brutality on the platform was designed to ignite that natural human compassion, causing the population(not only the UNC) to jump to the defence of kamla and jack. His plan was to get maximum media exposure and draw support away from the PNM and other political parties. Having jack as chairman would dispell any thoughts of the UNC being an indian party. Kamla is more important as she would set the stage for another futre female political leader. ……but what the hell is he doing now? if your theory is in fact correct, yeh, what the hell is he going to do now, it would seem that this move is somewhat of a suicide mission considering he has lost support, maybe this is his blase of glory that he envisioned, going out a martyr, maybe he would consider to blow up Rienzi now. A triumph of ordinary people over the political backwardness of a party oligarchy is one way to interpret the outcome of last Sunday’s internal elections of the United National Congress. UNC supporters determined they would take back the power they had so long reposed in the hands of Basdeo Panday to do with as he pleased. However, Kemchan Ramdath, chairman of the party’s election committee said last night a party membership card was not required at the polling station. All that was needed was a form of identification and for one’s name to be on the list of electors. CHAGUANAS West MP and newly elected chairman of the UNC, Austin Jack Warner, said last night that former UNC political leader Basdeo Panday was still in shock over the sound beating he suffered in the UNC’s internal elections last Sunday. New United National Congress (UNC) political leader Kamla Persad-Bissessar will discuss finding the party’s own headquarters when she meets with her executive today, at Rienzi Complex, Couva, which has been the base of its operations for 20 years. According to reports last night, Jack Warner the newly elected Chairman of the UNC was engaging in quiet diplomacy to garner the support of at least seven MPs who would write to President Richards indicating their support for Kamla Persad-Bissessar as Leader of the Opposition. United National Congress members who are loyal to Opposition Leader Basdeo Panday say there is no vacancy for Panday’s job. St Augustine MP Vasant Bharath said yesterday he has confidence in Basdeo Panday to continue serving as opposition leader. UNC Senate leader Wade Mark yesterday said he would be willing to serve as a senator under new UNC political leader Kamla Persad-Bissessar if she is appointed Opposition Leader. Roundly rejected Sunday by party members in his quest to become political leader of the UNC, Ramesh Lawrence Maharaj intends stepping back, but not out of politics. This is, he says, to give newly-elected leader Kamla Persad-Bissessar the chance to deliver on her campaign promises. In opening her contribution to the motion, Independent Senator Dana Seetahal said she was energised given the landslide victory by newly-elected UNC political leader Kamla Persad-Bissessar. The much-maligned membership committee of the United National Congress appears to have had the Tobago electorate list accurate. ONE day after being ousted as Political Leader of the United National Congress (UNC), former prime minister Basdeo Panday appeared in court on charges of failing to declare a London bank account to the Integrity Commission. Leader of Government Business Colmn Imbert said he was uncertain what would take place on the Opposition bench when the House of Representatives meets on Friday. My Hindi or is it Urdu ain’t dat good , so I don’t have a clue as to half of what this ambitious young woman was saying to her interviewer. Upon assuming some semblance of power , often many leaders are confronted with trying circumstances ,or must make quick major,unpopular decisions in effort to eventually move their organization, and agendas forward. Madame Kamla Persad-Bissessar, the new UNC Political Leader,has an excellent opportunity to prove to the nation once and for all that she is ready to deal with an over cocky, and sometimes arrogant PNM leadership machinery, that has dominated the national political scene for too long , and according to the views of many much smarter than my self ,have squandered the opportunities to make this small ‘Twin Republic State,’ into a shining gem, that can be the envy of the world. In one stroke she can finish what other testosterone laden cowards dreamt about , but never had the ‘cohones’ to do anything about, as far as ending the Bengal Tiger’s reign ,and subsequent coronation of his loyal daughter. She can finally drive the political nail into the coffin of Mr Basdeo Panday , and ensure he stays on his rocking chair in a new role as an elder statesman ,as well as ‘grand baby pampers changer,’ ever willing to proffer advice on how to ensure that his country thrive, as opposed to remaining a destructive , diabolical obstructionist , with a tarnish image where he is only remembered for ungratefulness, a vindictive nature , and corrupt individual with a desire to be some phantom martyr as he serves at least 10 years in jail for his corruption dealings while in power. Hey Karmla you have history on your side , in terms of tough decisions , so what course of action are prepared to take good lady for those who still love country over tribe in this our land? Tell us if you are prepared to ‘attack with full force’ as the Castara kid Robinson demanded of the security forces while staring up the barrel of a gun on that fateful 1990 occasion when a Muslim thug call Bakr, and his henchmen held them hostage in the Red House. Better yet, did Aweebouy give a hint of his style , when he along with his paltry two Tobago seats was prepared to go for the juggler of the politically uncouth ,and erratic , Bas and his close stooges Ramnath , and Sudama ,as they all tried to use their 10 seats ULF leverage to blackmail, and undermine his government, when unable to tell this ardent Westminster advocate whether he could break win, have a T-bone stake, or a glass of Pacro water with Ken Gordon , one of his ardent political benefactors? Harry Truman said ‘the buck stop here,’’ and ordered two atomic bombs on innocent Japanese killing millions and destroying much , thus saving Yankee boys lives and ending World war and terrorist kamikaze bombers. Geore W. Bush had to deal with Osama Bin Laden , and his nut case life after virgin lovers . For Bill Clinton ,it was starving Somalia , and Haitian boat people trying to escape Castro . Finally ,Obama had from Rev Wright to Swine Flu , Iran counterrevolution women ,Pirate baby face Somalian, two enduring ,and unending wars, and global recession. Some of these jokers see smoke and foolishly believe that it is a rain dance. Perhaps I should tell them again that such is not the case , for it is for the strong, willing and able at heart prepared to make the difficult, yet prudent choices. I refer to in by ‘Choices4power.’ Let’s see who would listen and succeed,or fall by the wayside instead as they choose to ‘break stick in their ears,’ in the words of the wise one- a woman. Why did Saddam try to twice risk everything by going up against the sole remaining global superpower, or Hitler and Napoleon to try and defeat the rest 0f the world during WW1&2 ? Who knows the thinking of the arrogant ,twisted minds of some larger than life leaders , with cowards for advisors. There are a host of theories to explain their actions from a political science point of view, but sometimes it’s simply that they are dellusional atheist. Let’s wish them well , my friend for it’s the only way to halt runaway mismanagement , growing arrogance and incompetence by the regime that is now destined to continue its stranglehold on the country until perhaps 2090 , unless someone still have the ability after four decades, to invigle the Tethron boys and gals in green to do more than beautiful Independence day parades . “My Hindi or is it Urdu ain’t that good”.These veiled references ,used by more than one contributor on this site are simply racist in nature.The days for these negative putdowns are long gone.References of this nature reflect poorly on those who use them.One would think that people today are more enlightened. My apologies T-Man ,I forgot to add that her comments were I understood it sounded fine and progressive, in a society where most of her gender are permanently fixed below the poverty line, unless dad can give away 5000 heads of cattle. I am beginning to can a bit worried about you T-Man, and may have to find a way to examine your newly grown Canadian horns.Are you certain that you own a T&T passport that not obtained not by selling substandard goods on George Street after traveling up the Birbice River ? I am concern about racism just like the next social activist around the corner , but this claim along with Canadian refugees,and PNM orchestrated Trini police induced genocide is getting as they say, preposterous . It is the prime reasons why after the wolflike howls, no one takes you characters seriously when there is a real tragedy , violations and threat to Human Rights. Get real my friend , and loose this over sensitive , politically correct behavior. Neal, Tman is right. You are offended when someone makes a derogatory racially charged or motivated comment concerning members of the African Diaspora. We understand the point without the racial or cultural undertone. If you don’t believe that the UNC leader speaks English the way that you would expect for a person that may be the next Prime Minister, and then just say that. Then you open up the dialogue for discussion about language and speech within society. Let’s bridge the gap between members of this so called callaloo rather than strengthen barriers. Remember that we are Trinibagonians first as members of this society. When we make divisive comments it interrupts the dialogue that will affect our lives. She could speak gibberish as long as she is effective in representing the best interest of all Trinibagonians first. It is all of our responsibility to hold one another accountable for improving this society in fairness whether we disagree with each other or not on some issues. I don’t think any of us want to be judged by the things that make us different over the things that unite us. If that is the case, we need more work than I thought. The shameful thing about it Neal is that you can do better. You don’t lack the mental capacity to get your point across without being hurtfull. Mr. Panday should be ashamed of himself. The politics of backwardness went out the back door, and he denies that he lost, just as he denied it in the last General Election, when the combined votes cast for COP and PNM exceeded the votes cast for him in his own constituency. People commenting in the Express has said over and over,”Go Bas, please go”, but he would not listen then, or now.I hope he shakes her hand in congratulation, which would say he has grown a bit since the last General Election, but I have my doubts.I hope if he does shake her hand, he will not wipe his hand afterwards, because skin color does not rub off. Now, I never liked this backward man, who would do anything to win. When he, and his team visited the American city I call home, as Prime Minister, although he had two people on his team whom I knew personally, one being a former student of mine, I refused to go see or hear him, and support the TnT Association of Texas. I had seen the worst aspect of his character on three occasions before he became Prime Minister.I will not recall them on this post, but two were public occasions. Now that he has lost, he challenges the Parliamentary System by continuing to consider himself the leader of the opposition, and some foolhardy members of his party in Parliament support him in this childish nonsense. Thus, the UNC, instead of unifying under Kamla and Jack would continue their wrangling in public, while calling itself the party of national unity. Someone needs to persuade his daughter, also an MP, to persuade dear old dad to give up the power he has loved for so long. He must not continue to threaten, by his conduct, the chances of TnT’s first female Leader of The Opposition. The world is watching, Bas. Do the right thing. Man up to losing, fair and square, and Step Down. “Curmudgeon Of The Year”, and “Sour Puss Griper” are not worthy titles for someone who has been in public service so long. Your point is taken Curtis. I can see where unfortunately my communication efforts would be misconstrued. Again I apologize for any unintended slight that might be inferred by the video. Having said that , I wish to make the following in clarification once more , as I believe my initial response to T- man ,with all it’s attendant attempts at humor , was not again that clear. I latched on to the video , simply because I was fascinated by the honest enthusiasm of the young lady being interviewed. I saw something of a parallel with that of which the new Opposition leader Madam K was trying to do here in T&T as she tried to wrestle the baton away from the reluctant patriarchal old guard in her quest for empowerment. Irrespective of the long term outcome at the national level , it sends a strong message as to what can be achieve in our country when the will exist. As such I have un-hesitantly supported her , and hope she takes the next steps to achieve her wider goals. Now let’s take a look at the crux of your accusations Curtis. You said for example,”if you don’t believe that the UNC leader speaks English the way that you would expect for a person that may be the next Prime Minister, and then just say that.” Were you along with T-Man seriously implying that I was trying to make fun of Madam Kamela’s speech,even if I have never heard her speak, or saw her in my entire life? I just don’t get the logic in that argument Curtis. Isn’t she a respected , qualified lawyer , and former Attorney General of our country? Why would I think her English is flawed to be PM? How sad indeed that we have reached this point as far as communication, but perhaps it’s time I finally take the cue and give this contentious blogging business a rest as it is at times too exacting . I have a book to finish reading , and successes I wish to emulate as I too try to help build my country – but from the ground up. I wish you well, and thanks again. I think that after reading someones post, I will reflect and then read it again before I post. We live we learn. Linda could not be more correct on Basdeo Panday.History has shown that when he does not get his way he destroys.Hopefully this time he will fail. The only thing left for Bas. to hold on to is Omars hand and a everlasting nightmare from his devastating loss in the elections.